On this year’s stand, John Baker, an expert demonstrator, provided his expertise, gave great demonstrations, and offered his knowledge to interested attendees. 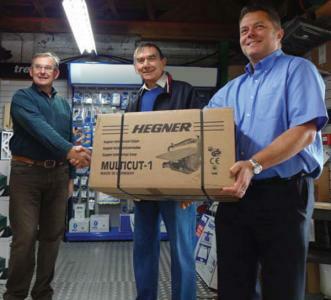 Hegner ran a fantastic competition to ‘Win a Hegner Scrollsaw’ which was extremely popular! The lucky winner was Eric Groundsell, a local woodturning enthusiast, who entered the prize draw when he visited the Hegner stand and didn’t really think anything of it as he went on his holiday following the show. “We were very keen to contact the lucky winner and let them know they had won this fantastic prize” commented Gregg Corbett, Managing Director at Technology Supplies (based in Shrewsbury, Shropshire) who are the sole distributors for Hegner in the UK. “I came back from holiday and was so excited when I listened to my messages, and found out I had won. I never normally win anything – what a great prize” Eric commented. Eric, a keen woodturner, is looking forward to using his Hegner scrollsaw, something he has been very interested to use for a long time. Eric is a member of the AWGB (Association of Woodturners of Great Britain) which provides support and advice for woodturning enthusiasts runs training courses for adults, as well as having a youth training initiative. Hegner products are renowned for their longevity, quality and precision which includes lathes, scrollsaws and sanding equipment and supplies for woodturning and woodworking enthusiasts & professionals, as well as a specialist range suitable for education. For more information about the full product range visit hegner.co.uk or call 0845 567 0001. Exceptional quality machines for precision working.